I was made homeless (A family member that sexually abused me and my brothers when I was younger, owned the house me and my parents were staying in, and I could no longer live there) after being placed in a flat, in one of the most homophobic communities – every mental disability and illness I had just exploded and became 10 times worse and I resorted to excessive drinking in order to force myself to leave the house. I have always been my own worst nightmare. I reject a lot of the help, finding any reason that I can use. . . But something’s are just out of my control and without that need, that drive, to regain who I was – I will let myself lie in my bed, shut myself off from the world and complain about anything and everything that I can because… That is who I have Become. Read Chrisies’ post in its entirety! Visit Who I’ve Become. | Chrisies Criss-Crossed Life.. This entry was posted in Chrisies Criss-Crossed Life. 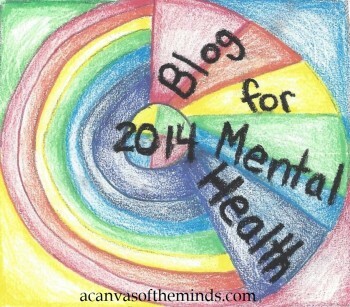 and tagged Blog For Mental Health 2014, health and wellness, mental health on 2014/11/27 by Ruby Tuesday. Read Erica’s post in its entirety! Visit Panic in ShopRite | Suburban Hobo. This entry was posted in Suburban Hobo and tagged Blog For Mental Health 2014, health and wellness, mental health on 2014/11/27 by Ruby Tuesday. University can be difficult for someone with social anxiety. Some of these are based off the experiences of people I asked on the social anxiety support forum. 1) There’s that struggle when you walk from class to class. . .
2) And the constant fear of failing or being dumber than everyone else. . .
3) Being put into groups is stressful. . .
4) It’s unfair being made to do presentations when you have social anxiety. . .
5) And yet with all these forced social situations, you feel…disconnected. . .
Read Polaris’ piece in its entirety (it comes in comic strip form)! Visit 5 socially anxious things at university and college | Graduate from Social Anxiety. This entry was posted in Graduate from Social Anxiety and tagged Blog For Mental Health 2014, health and wellness, mental health on 2014/11/27 by Ruby Tuesday.
. . . I think I must be the only person in the world who likes Monday mornings. The arrival of Monday morning means another Sunday has been and gone. For as long as I can remember, Sundays have been somewhat nondescript. There’s nothing particularly bad or good about them, just a feeling of emptiness and numbness. I am a nine to five worker but I can’t even put this down to “anxiety about the week ahead” as I rely on the week’s activities to keep me distracted. And that’s how I try to deal with my Sundays, by keeping myself distracted. All in all, my life is pretty good. I have friends, have a job, no physical health problems and no apparent reason to be unhappy. I have also struggled with depression since the age of seventeen. I am now twenty four years old and though I have both ups and downs, I am still looking for the best ways to help deal with the downs. Read Sunday Girl’s post in its entirety! Visit Tell me why? I don’t like Sundays… | Diary of a Sunday Girl. This entry was posted in Diary of a Sunday Girl and tagged Blog For Mental Health 2014, health and wellness, mental health on 2014/11/27 by Ruby Tuesday. After doing some research, I have found a network of blogs that have similar purpose to mine. 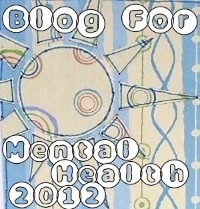 I have decided to participate in this, the ‘Blog for Mental Health’ initiative in the hopes that my entries will reach a wider community of people, and help and encourage more people, as they will also do for me.
. . . I hope that by sharing my experiences, and my tactics to get better, I will be able to help those also suffering. I will be making a new entry soon, and will continue to do so. Read Jessica’s post in its entirety! 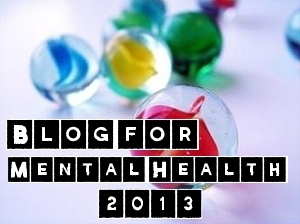 Visit Blog for Mental Health 2014 | KEEP IT MOVING. This entry was posted in KEEP IT MOVING and tagged Blog For Mental Health 2014, health and wellness, mental health on 2014/11/27 by Ruby Tuesday. I am currently reading The Unlikely Pilgrimage of Harold Fry, which is awesome! . . .
Read more of Christy’s story! Visit The Dilemma of Being Human | Normal in Training. This entry was posted in Normal in Training and tagged Blog For Mental Health 2014, health and wellness, mental health on 2014/11/25 by Ruby Tuesday. I’ve suspected for a while that I have been developing some form of social anxiety, I’ve been avoiding people, staying in bed longer than I should and not wanting to go to work. But today, for the first time I truly realised the severity of my “new” condition. When I was younger, I can’t pinpoint the exact age, Sometimes, when I was surrounded by a lot of people, or I had to talk in front of the class or even sometimes just randomly for no reason I would suddenly feel like I wasn’t ok and that I wanted to be at home lying on the sofa with my blanket and a milkshake. I used to refer to it (in my head as I never told anyone about it) as the “milkshake feeling” (I used to drink nothing but strawberry milkshake from about the age of 3-12) I hadn’t had the “milkshake feeling” for a long time but yesterday I had it twice. It doesn’t last long, but it makes me feel like I need to get away from things, I feel like I want to go and lie on the floor, and curl up or hide, I feel scared, like I’m going to lose control and start crying and all I can think about is being in the one place that I must assume is “safe” my sofa. With the things that made me happy as a child. Is this a panic attack? I don’t know, but what I do know is that sometimes this is accompanied with a breathless feeling and worry and it is panic induced. . . I think the “milkshake feeling” is a nostalgic feeling of being content. It reminds me of when I would have a sick day from school and I would lay on the sofa (with my milkshake) and watch TV. I guess I felt safe because I was indoors, happy because I wasn’t at school and looked after because I was a child and my mum was there watching TV and making sure I was ok, of course, this is different now and I wouldn’t expect her to drop everything and look after me if I threw up a few times. It’s that feeling of safety that I guess is my brains go to juncture when I really start to panic. Read more of The Elephant in the Room’s story! Visit Here Comes the Anxiety | The Elephant in the Room. This entry was posted in The Elephant in the Room and tagged Blog For Mental Health 2014, health and wellness, mental health on 2014/11/25 by Ruby Tuesday. Read more of Christy’s story! Visit Declaration of Independence | Normal in Training. Trigger Warning: Extensive talk of suicide – in a sensitive, non-graphic, but still potentially triggering manner. But something I felt strongly enough about to share here nonetheless. Suicide is an irrational thing. When you ask that question, you are trying to find reason in the unreasonable. Rationality in the irrational. Sense in the senseless. It’s just not there. To the individuals considering this potentially final act of their lives, it feels VERY rational. There can be all kinds of reasons in their minds that make it desirable, or even seem as though it’s their only option – that they have no other choice. And when confronted with rational statements – perhaps explaining why their reasons aren’t as valid and solid as they feel they are – believe it or not, that (at least in my experience) doesn’t help. In fact, it can make the individual feel even worse. . . Suicide rarely – if ever – makes sense to those left behind. But this is the nature of suicidal thinking. It doesn’t make sense to you because it really shouldn’t make sense. The only way you can make sense of it is to recognize that the individual is not thinking 100% rationally (despite how they might feel). . . When you berate someone for contemplating or even completing suicide, you are displaying a blatant misunderstanding and ignorance about the issue. Of course, this probably isn’t your fault (so please don’t take that statement personally), as there are a lot of misconceptions and stigmas out there. I’m writing this post to help combat those misconceptions and stigmas. To bring a smidgen of understanding to an oft misunderstood act. . .
And it can go the other way, too. Sometimes I feel like such a burden on my loved ones that I think I would be doing them a favor to leave their lives. That my fiancé deserves so much more happiness than I can provide, for example. It is selfish of me to stick around when my existence causes so many problems. That is another example of when the irrational feels rational. So rather than think of us as selfish for wanting to do something that can cause so much anguish to others, keep in mind that often times we’re doing everything in our power to keep from being selfish. Whether it’s hanging on to spare others’ their pain or letting go to spare others’ their pain, the sentiment is still the same. And for those who do follow through and succeed, remember: it’s not rational. It doesn’t make sense. Chances are very good they held on much longer than they wanted to, to keep from hurting anyone. And to go through with it anyway, they must have been in unimaginable pain. Read more of Ashleigh’s story. Visit Passion for Life, Love, and Health – What it’s Like to Feel Suicidal (or, How to Make Sense of it All). This entry was posted in Passion for Life Love and Health and tagged Blog For Mental Health 2014, health and wellness, mental health on 2014/11/25 by Ruby Tuesday. But now I realize that learning how to comfort yourself is a lot like getting to know your baby. You learn from trial and error how to distinguish the hunger cry from the tired cry. You learn the idiosyncratic things that make her feel better–like driving around the block, or putting music on, or cradling her in a certain way. . .
Read more of Christy’s story! Visit Self-Soothing | Normal in Training. Beautiful Contemplations – That beautiful fear remains me. I so desperately want to survive this pain. Holding my arms together, side by side; representing polar opposites. On my left arm, old, faded scars- episodic visions of terror and distress are hidden beautifully by the tattooed words ” You are loved. My right hand however, displays the happenings of my latest episode…. caused by silence, those voiceless feelings that tell you there is no other option; destabilized rationality tell you that even if you had a voice, it would not be heard. After the storm, after it is done. hush little baby, put down that razor, don’t harm yourself. I express to myself how I live the life of a child. My life representative of an inner child in need of protection. My rational self vows never to hurt myself because after all I am just a child, my sensibilities are that of a child. I pray so beautifully that my irrational self will never again come to the surface, a reality I know is all too good to be true. I can only hope that next time I will be able to fight my irrational self just that little bit more. Read the rest of the story! Visit That beautiful fear remains me. I so desperately want to survive this pain. | Beautiful Contemplations. This entry was posted in Beautiful Contemplations and tagged Blog For Mental Health 2014, health and wellness, mental health on 2014/11/24 by Ruby Tuesday.